The Contents: I chose the contents based on things I need when I am teaching. Below is the suggested list, but I also considered adding things like Band-aids, a good red pen, hair bands or a clippy, and even a feminine product or two since my children have female teachers this year (but the box was clear, and I thought that might have the potential for an embarrassing situation– although not having that item can create an embarrassing situation too, so you decide). 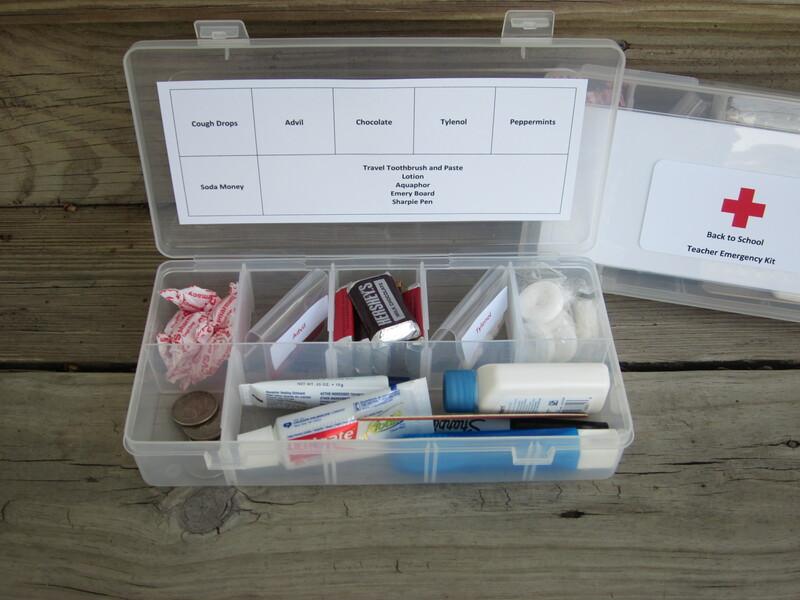 The Labels: I printed a 2″x4″ label for the lid of the box using the Red Cross logo to make it look like an emergency kit. I created a table for the inside of the box and printed it on cardstock. Using a paper cutter, I cut it down to fit the inside lid and attached it with clear tape. I wanted the “map” on the inside to look like one of those lists they have in the big chocolate candy boxes, so you know what kind of chocolate you are eating. 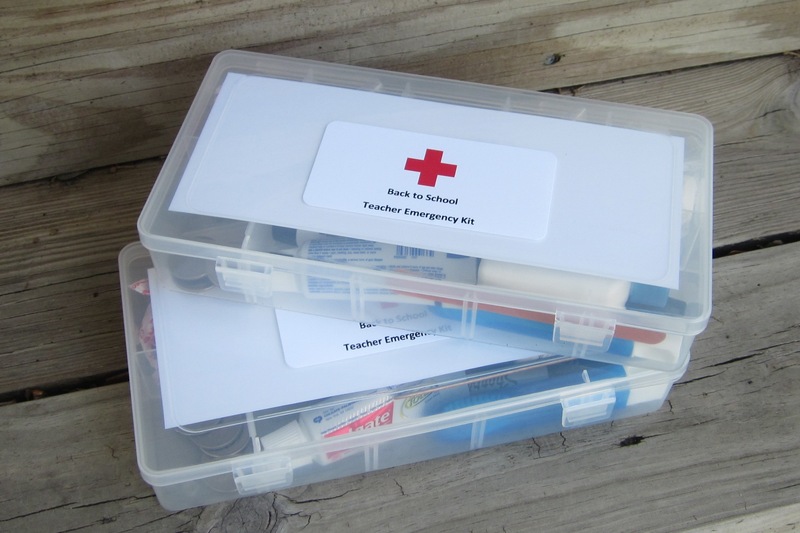 Here is a copy of the teacher emergency kit map. I am going to have to make one for myself too because I don’t think any of my class parents this year read the blog! I love this idea. 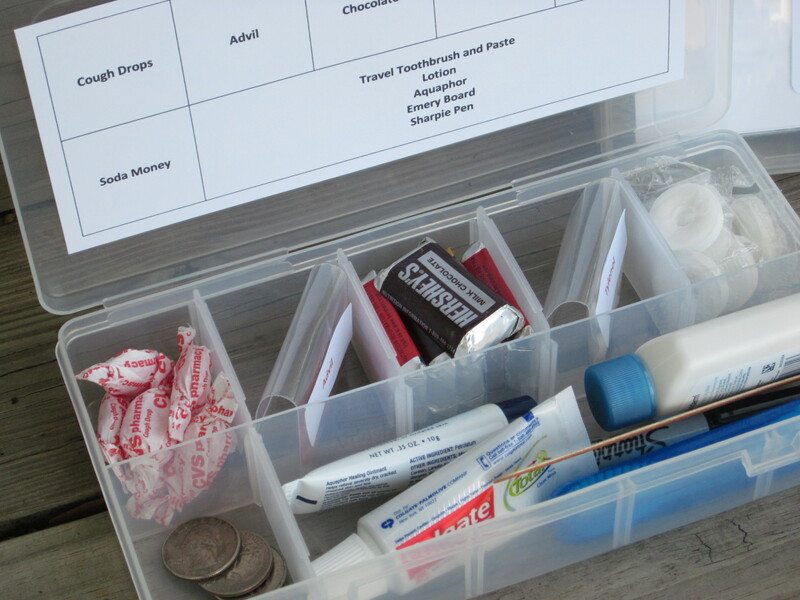 I used to have a first aid kit, but I teach high school and it kept getting depleted. I used my coupon goddess status for toiletries, and now I am the Teacher Who Has Tampons, so when I see mystery chicas walk quietly into my room and go through my left desk drawer, I know nobody’s lifting my “DO OVER” stamp. Thanks for the comment. I taught high school at one point, and it is a whole different world from 4th grade! How nice that you keep supplies in your desk drawer. It is much better than having to figure out how to get a pass down to the nurse’s office. I followed a principal from a middle school to a high school. The class load (150+ students) was too much for me. I could not assign decent writing assignments and keep up with the grades. I also missed the literature in 4th through 6th grades and the fun activities that I can do with all of these good books. Upper elementary is my sweet spot! Thanks for following me. I do try to post strategies that work across all grade levels, so you might find something useful (I hope!). That food is inspiring enough:) But I like strategies, too.